William Laman Furniture.Garden.Antiques - Articulated Vase Set; Sm. Accessories → Vases → Articulated Vase Set; Sm. Item No. 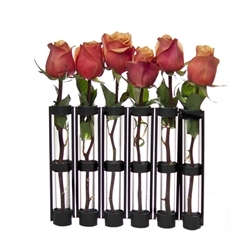 75 Articulated Black metal grid with six individual small test tube vases. Add an additional set end to end for one long floral arrangement. Item N. 82 Glass Tube Replacement Vase; Sm.